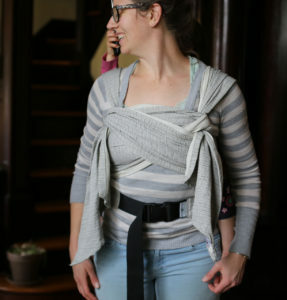 One of the reasons I love the library is that there are almost as many babywearing carrier options as there are caregivers and babies, but you don’t have to *buy* them all in order to try them all! 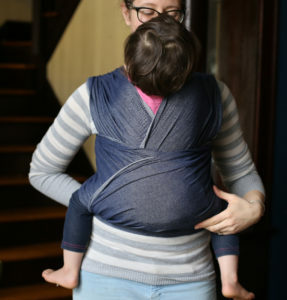 The XOXO Buckle Wrap was recently introduced to the babywearing world, and if you haven’t seen it yet, it’s exactly what the name implies: a hybrid wrap and buckle carrier. 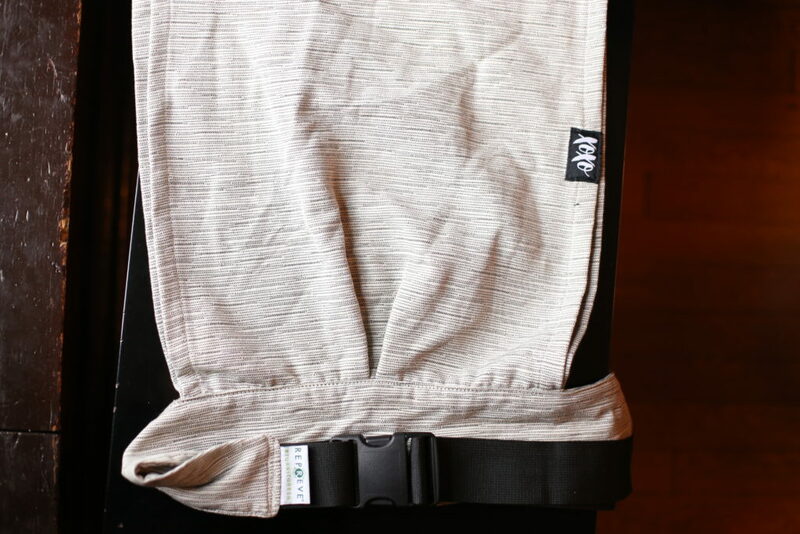 There is a waist band that buckles on, with two long wrap panels attached to it that are used to make passes around your baby. This takes the learning curve out of making a seat with the wrap fabric, although I found that it still does take a little practice to get the wrap panels positioned and tightened correctly. We recently added two XOXO carriers to the BWI of STL library! I had a chance to try out both of these with my 27lb toddler. I was worried the Denim…ish version would be crunchy and hard to tie off, but it was actually quite thin and easy to work with. 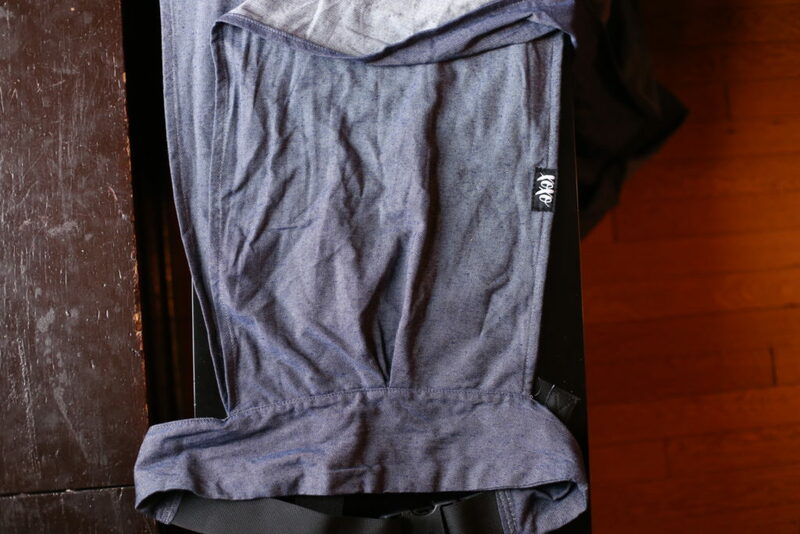 The Grayscale with Repreve is made from recycled plastic bottles, but doesn’t feel like it at all. I tried front and back carries with my toddler, who prefers to ride arms-out. That made it a little difficult for me at first to get the passes up high enough to support her without going over her shoulders, but a few practice tries had us comfortable and secure. The length of the fabric panels was great for crossing in the back and then reinforcing the seat and finishing with a double knot in the back. 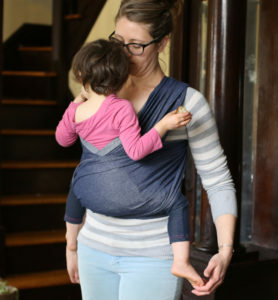 Front carry with arms in – very snug! But she prefers arms out. The two wrap panels cross in the back – very comfy! For the back carry, the length of the wrap panels was again just right for reinforcing the seat, and then I finished with a knotless Tibetan finish in front. I usually prefer the wrap fabric to reach up to her armpits. This was a little low but still plenty secure! Really comfortable finished this way. If you are interested in wrapping your baby but are nervous about getting all of the elements together (making a seat, setting the passes, tightening properly), then this can be a great option for starting out; the seat is built in and completely unpoppable! 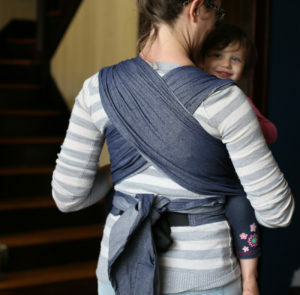 The unstructured waistband allows for it to be worn quite high if you prefer, resulting in a higher back carry for a baby. I did find that I much preferred this with a baby rather than a toddler as it was fussy to get the passes high and snug with a toddler, but it is definitely worth trying if you want to dip your toe into the world of woven wraps.